I've always been a big fan of cute handmade jewellery. 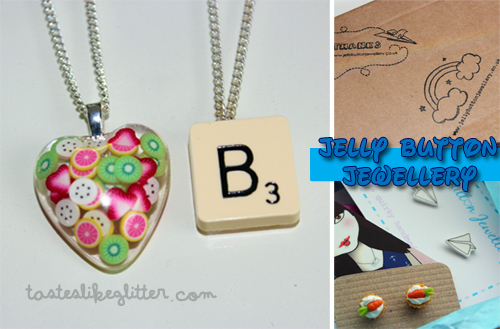 I recently came across Jelly Button Jewellery on Twitter and the lovely owner was offering up samples for blog posts. I jumped at the chance as I cannot for the life of me make decisions, hence why I've never purchased. Here I have a few bits that Michelle (the owner) sent me*. First up we have the Summer Fruits Heart Necklace. It's a medium sized plastic heart full of fimo fruits. Delicious and perfect for Summer. Something that seems to be quite popular at the moment is Scrabble pieces. The other necklace I received was the Scrabble Letter Necklace on a silver chain. This is probably the best value for it I've seen but the price doesn't mean the quality is scrimped on. A simple but really nice piece. Lastly I have two pairs of earrings. The Paper Planes, these are so cute and the first thing I was drawn to when browsing the site. And Teeny Tiny Carrot Cake Cupcakes, these are minute but the detail is fabulous for such a tiny item. I don't currently have my ears pierced (waiting for a stretched ear to close up) and then I will be getting them redone. So I will post photos of me wearing them just as soon as I do. It comes wonderfully wrapped so makes a great gift for yourself or a friend. Overall a really wonderful company with delicious looking jewellery at really great prices. I've been eyeing up plenty of other pieces that I plan on buying in the near future.